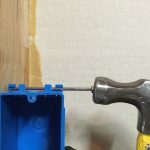 You are at:Home»Geekery»How-to's»Build a Makerspace – Part 3 – Framed! Ok, this time we have everything here so we are going to get this done. We start by cutting all the needed 2″x4″x10′ boards to 8′ 6″ long. 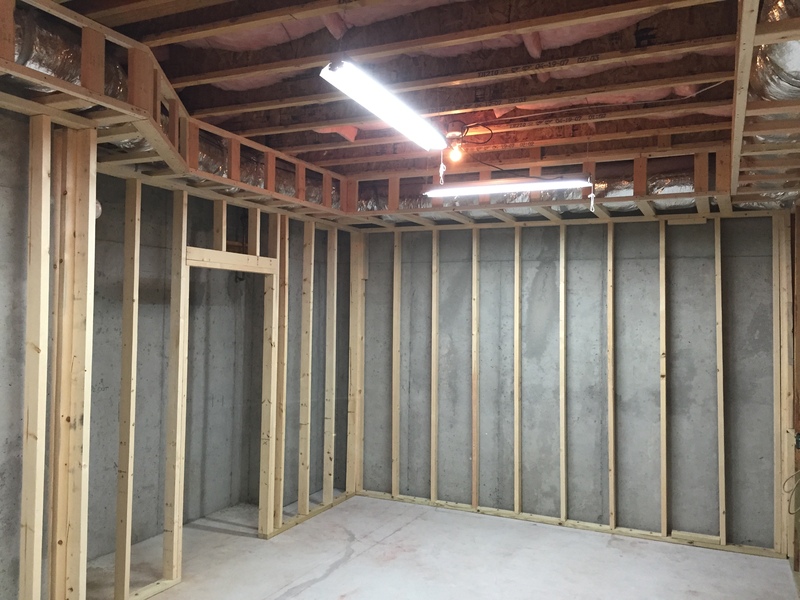 As our walls are going to be 8′ 10″ before the tray this is to accommodate for the footer and header on each wall. 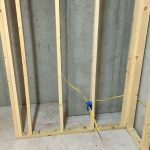 The footers were pressure treated 2″x4″x12′ lumber and we used a cartridge riffle gun to shoot the nails into the concrete. 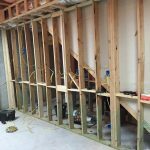 The headers were constructed with 2×2 beams and 2×4 ribs on the ground and then nailed in place above the walls. This was hard work but easier to do with a helper because they were pretty heavy once built. 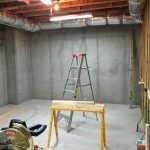 We had to build in the headers to cover the ventilation that runs from the HVAC in the basement up to the first floor. This will also add some visual interest to the ceiling which sounds nice but adds a lot of work to the drywall, mudding, sanding and ultimately the trim assuming I ever put any on the ceiling down there. 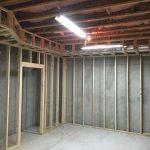 the framing made the room start feel complete and now it is really starting to take shape in to the soon to be workshop. 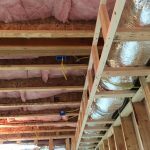 This is the last time that you will be able to lay out critical things such as electrical outlets, lights, and other hidden amenities such as dust collection for saws or compressor air lines. if you want those hidden now is the time to run your lines. 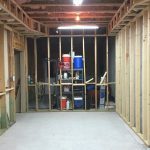 I have decided to not run any kind of access for air or vac as I have access to the back of most of these walls via the closets that surround my workshop area should I ever decide to do such things. 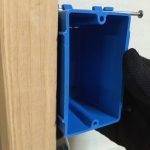 I went nuts with outlets and am running 2 new breakers to the workshop as I have lots of room in my breaker boxes but you may need to hire an electrician to add a new box with more room in order to expand your system to fit the new circuits. (Do not attempt to modify your electric system without first cutting off the power completely!! 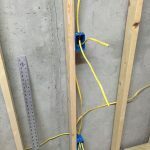 Also, failure to properly wire electrical outlets, breakers, grounds, or any other component of your Alternating current electrical system may result in death, fire, explosions, or serious injury.) 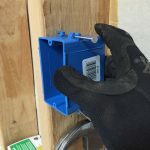 If you are unsure about how to perform these tasks, call a licensed and qualified electrician. 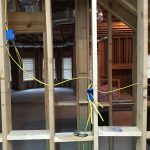 We used Romex coated “Yellow” 12 gauge wire for the entire system. this leads back to 2 breakers in my box. both breakers are 20 Amps. Be sure to check if your mains service from the power company is sufficient to cover the intended loads. I have 2, 150 Amp circuits running into my house so adding these breakers was fine. We broke the system into 2 main lines, one breaker for all the wall outlets and one breaker for all of the bench outlets. 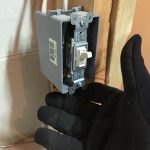 The lights are on a separate breaker that was already in place to cut down on bulb strain when high amp devices switch on and spike the circuit. 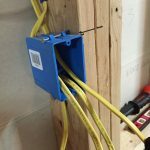 All electrical wires should be secured to the stud just outside of the box for safety. Wire Everything BEFORE you ever think about hooking the wires to the breakers. 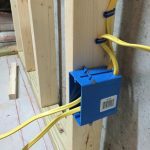 or better yet, don’t touch your breaker box and hire an electrician to do the final connections and check your work. 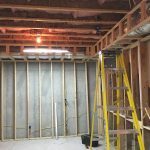 We won’t actually be hooking the wires to outlets, switches or breakers until I’m all done with insulation, drywall, mudding, sanding and painting.